We keep a sharp eye out for any sign of Spring. It’s not that we are impatient for Winter to be gone, we wouldn’t be so impolite, but we would like some reassurance that Spring still has us on her To Do list. We have snowdrops everywhere, and many green spear-like leaves promising hyacinths, bluebells, daffodils and crocuses. Now, there is a difference between birdsong and bird calls. Birds call all year round, but most only sing during the mating season. 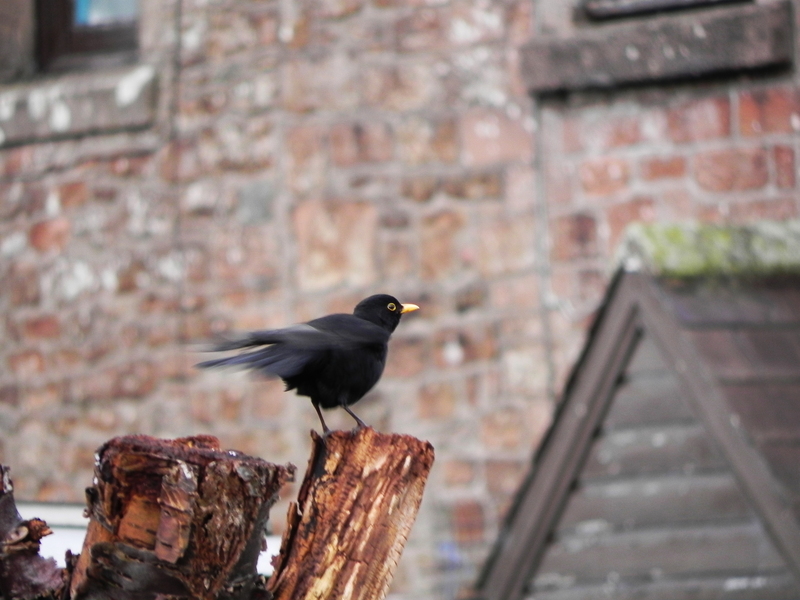 The blackbird is one of those with a markedly different set of sounds for Spring. With it being such a long time since last year, he can’t quite remember how the tune goes. As soon as he’s sure that Spring is really on the way, he will find a quiet corner and practise a few trills quietly to himself. We’ve caught him doing this a few times these last few days – so I wrote him a poem. stirring in me brief thoughts of spring. as if some half remembered song. not knowing I had overheard. silently left him to his practising.